You easily can tell that the realm of luxury two-up snowmobiling scores low in the world of snowmobile marketing. Look around at what’s new for 2013. See many all-new two-up sleds? The facts are in the sales numbers. Two-up sled buyers don’t have the clout of deep powder riders or the serious big bump riders. And then there is the growing world of the stretched track crossover models, which are actually becoming the “new” all-around trail model. A 1056cc Suzuki-built four-stroke gives the TZ1 smooth drive-aways and stout midrange, which are ideal for two-up riding. trail sled. Of course, in Arctic Cat’s domain, the clarity is muddled with a changeover from the older Twin Spar chassis design to the new ProCross and ProClimb models. But if you look at Ski-Doo and Polaris, you’ll see 136 or 137 inched track lengths utilized on both of their crossover and touring models. 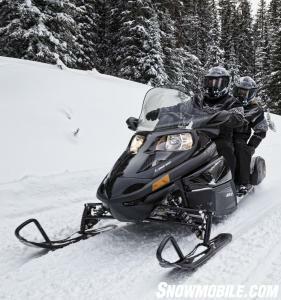 Two-up luxury touring sleds may share commonality in the underpinnings, but the final product and character of the touring sled versus crossover differs substantially. Manufacturers infrequently build a sled with a singular purpose. It’s not cost-effective. 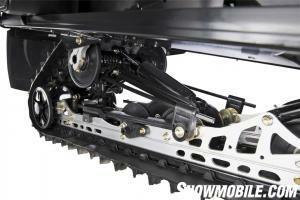 But, taking a similar chassis and creating niche sleds can be profitable and hold costs down for consumers. 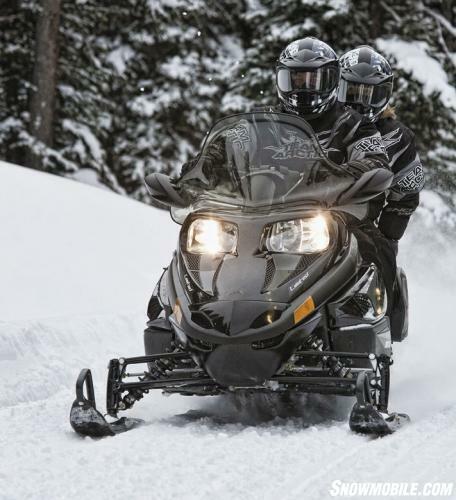 The intent of a two-up sled, whether luxury or base model, is to provide a comfortable platform for two-riders over a longish snowmobile trip. Certain assumptions get made and embellished depending on the level of luxury. 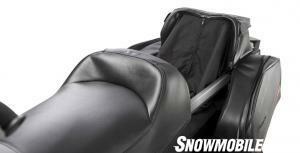 A two-up sled needs to be of a certain length to accommodate two adult passengers and some cargo. There needs to be a longish track length to create ample grip and to establish a good wheelbase to ensure a comfortable ride over groomed trails. Power for this sled can range from the basics of a 55-horsepower fan-cooled up to a turbocharged four-stroke’s 177-hp. Regardless of the power output, the engine must supply steady and smooth torque necessary for smooth drive-offs and stout midrange. Top speed doesn’t matter as much in a two-up luxury sled as it does in a high performance trail design. A detachable passenger seat means extra room and versatility for a solo rider. Ice fishing anyone? 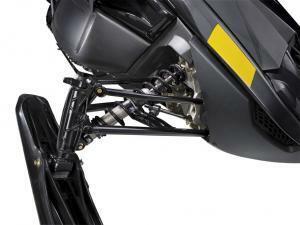 Within those parameters each snowmobile manufacturer establishes its own list of ingredients. Luxury two-ups in this era generally gain the benefits of 1000cc, quiet yet smooth, four-stroke fuel injected engines. Yamaha and Ski-Doo offer three-cylinder four-strokes. Polaris has a turbocharged 750cc twin. And Arctic Cat features a 1,056cc four-stroke twin that’s available with or without a turbocharger. The TZ1 LXR draws the non-turbo version of the Suzuki-built twin, in what will be nearing its last season of availability in an Arctic Cat chassis. Future Arctic Cat touring models beyond 2013 may be quite different than this one as the Thief River Falls, Minn. snowmobile maker already promises non-Suzuki power in its products by fiscal year 2015. The seventh generation of Arctic’s Wishbone front suspension works well for long haul touring. For 2013, the TZ1 LXR represents a tried and very comfortable two-up touring machine. While some Cat fans bemoaned the Twin Spar design when it replaced the low-slung, Firecat chassis, we doubt many serious long distance touring riders did. The Twin Spar chassis may not be ideal for high performance riders, though we personally may disagree. The Twin Spar excels as a touring sled chassis. It brings the rider forward, places a rider’s legs and thighs in a very comfortable riding position suitable for all-day, high mile rides. The body panels tend to flow cold air around and depending on the size of the windshield, the cold flies over you. The basic sled takes creature comfort into mind and Arctic Cat engineers refined this stretched track sled with long haul comfort features like Fox Zero Pro front shocks on the seventh generation Arctic Wishbone Suspension. The skis will move through up to 9.5-inches of vertical travel to absorb groomed trail dips. The FasTrack slide-action rear suspension is a showcase of efficiency with not only bump-absorbing hydraulic twin-tube shocks, but a set of easily adjusted fiberglass overload springs. You should note that the rear axle sits behind the rear passenger, assuring a smooth and consistent ride as all travel action happens ahead of the axle mounting. Equipped with adjustable fiberglass overload springs, the TZ1 LXR’s rear suspension can be fine-tuned for solo or two-up riding. Comfort is key to two-up luxury touring. Count on the Suzuki twin’s electronics to not only maximize efficiency of the fuel ingested by the dual 48mm throttle bodies, but to also supply power to the standard heated driver and passenger seat, the hand and thumb warmers, an electric fuel gauge, accessory outlet and various gauges, including the prominent deluxe combination digital and analog gauge. 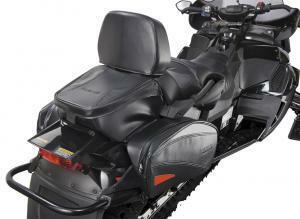 The LXR version of Arctic’s 2013 TZ1 touring sled adds custom touring baggage that mounts around the rear rack. We already mentioned the LXR’s upgraded shock package that comes standard along with the upgraded bags. Ultimate rider fit comes with the fully adjustable handlebars also standard on the LXR. Other standard features also include push-button reverse on the four-stroke drivetrain that features Arctic’s smooth Diamond Drive planetary gearcase. The LXR luxury version of Cat’s TZ1 two-up sled adds standard touring baggage to the rear rack area. If you decide to take a weekend of snowmobiling for yourself, you’ll appreciate the detachable passenger seat, which can give you extra room for ice fishing gear or whatever. But, most likely the TZ1 LXR will be used to enjoy destination snowmobiling. Whether you ride multiple directions during the day from the same overnight spot or engage in resort-to-resort rides, this sled will make the days seem short as you can expect to end your sledding day tired from being outdoors, but not worn out as the Arctic Cat idea of two-up touring centers around long haul comfort. Cat’s LXR version further sets itself apart as it comes with a black painted body and “blacked-out” graphics package while the base model features the naked aluminum tunnel, gray and white graphics and Ryde FX shocks front and rear. Both models use a 144-inch Hacksaw track with one-inch profile lug for smooth trail grip. Built on Arctic Cat’s Twin Spar rider-forward platform, the 2013 TZ1 LXR offers comfort and great ergonomics for touring. Most touring sleds offer good amounts of on-trail comfort gear, but this top line Arctic Cat two-up hits the mark with seating that’s not simply ergonomically set but heated as well. With all the very nice to have features and smooth all-day four-stroke power, the 2013 Arctic Cat TZ1 LXR is a touring sled that continues in the “Catillac” tradition of past generations of full-featured Cat touring sleds.